Palliative care is getting increased attention as health systems, community-based providers, and payers develop strategies for value-based care models. 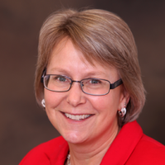 It is imperative that palliative care programs demonstrate their value in order to participate in this shift. Demonstration of value requires data on clinical outcomes and utilization, a process that is facilitated by an electronic health record (EHR) designed to track, analyze, and report these outcomes. Leveraging the EHR can enhance team communication, utilize clinical data to improve documentation efficiency, assess treatment efficacy, and allow for ease of data extraction for process and outcome measures. 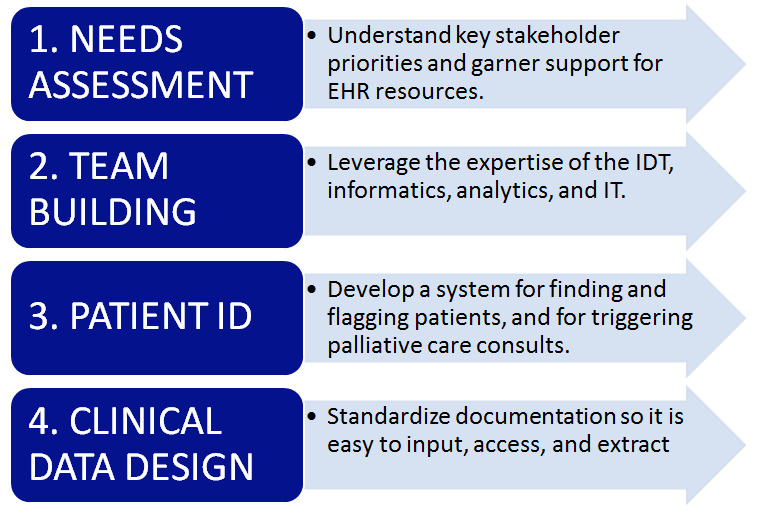 A well-designed EHR can also enable proactive identification of patients that could benefit from a palliative care consultation, and promote standardized use of evidence-based screening and assessment tools to guide best practice. As a palliative care team member, how does one engage in this work? The interdisciplinary team has to drive optimization by collaborating with their organization’s informatics and analytics specialists. The palliative team has the clinical expertise, the informatics specialist knows what the software can do, and analytics specialists know how to extract the data. Let’s start at the beginning: who do you want to identify (see Step 1 above), and how do you want to identify potential palliative care patients within that group (or groups)? One option is to create a screening tool within the record that gets incorporated into workflows. For example, a palliative care screening tool (e.g., functional status, uncontrolled symptoms, family distress, frequent ED visits, or hospitalizations) can be incorporated into the daily workflow of admitting nurses and care coordinators in the hospital setting. These screening results can generate a best practice alert which can automate an order for palliative care consult (see a March 2017 JOP study on the positive outcomes of palliative care triggers for oncology patients here). Another option is a palliative care registry that automatically pulls patients in based on pre-specified criteria. The registry can also be used to manage and track outcomes for the palliative care population. All palliative care consults should utilize the secondary ICD-10 Diagnosis Code Z51.5. Once patients are identified and assessed, other members of the health care team can know the patient is being followed by palliative care using the EHR’s “flag” function. An FYI flag appears in the banner in some EHRs, while other EHRs may use a “palliative encounter” in the diagnoses section to identify these patients. All palliative care consults should utilize the secondary ICD-10 Diagnosis Code Z51.5. Now that you have identified and assessed your patients, how are you documenting clinical information? Many providers develop progress notes that incorporate evidence-based screening tools, such as the and the Edmonton Symptom Assessment Scale (revised). It is advisable not to document with simply a progress note. First, depending on your EHR setup, a narrative progress note may not be visible to the other members of the palliative care team and other clinicians caring for the same patient. Second, narrative prose data are difficult to extract in a consistent and standardized manner from the EHR. Finally, it is inefficient use of time if each provider develops and writes his or her own version of a template progress note. The resulting variation in documentation may adversely affect not only the quality of care but also the potential for appropriate reimbursement. Standardizing documentation requires engaging representatives from each discipline of the palliative care team, as well as both informatics and analytics specialists, to develop documentation tools for the entire team. Start by identifying some core principles. The documentation should be easily accessible to all team members as well as other health care providers. The assessment tools should be standardized, comprehensive, effective, and efficient, as well as encouraging of best practice and allowing for extraction of data for measurement. Use only those assessment tools that provide you with actionable data. Avoid measuring something if you have no idea what to do with the data. Ideally, for those using an EHR, that includes hospital and ambulatory settings, these tools should be available across care settings. In my program, we developed a palliative care documentation flow sheet that includes evidence-based screening tools (see above) that all team members can utilize. All team members as well as other providers can see each other’s documentation. Providers can pull information from the flow sheet into their progress note. Clinical data are easily extracted from the flow sheet for process and outcome measures on pain, dyspnea, advance care planning, etc. The flow sheet rows are the same across care settings. A palliative synopsis function allows for a trending view of flow sheet data over time and across care settings. The team uses this function to evaluate effectiveness of treatments and determine a patient’s improvement or decline, which also informs prognosis and hospice eligibility. In summary, through collaboration with information systems and analytics representatives, clinicians can enhance and optimize documentation and reporting tools in the EHR. Successful collaboration results in improved team communication, improved quality of care and patient experience, and the ongoing demonstration of value to key stakeholders.